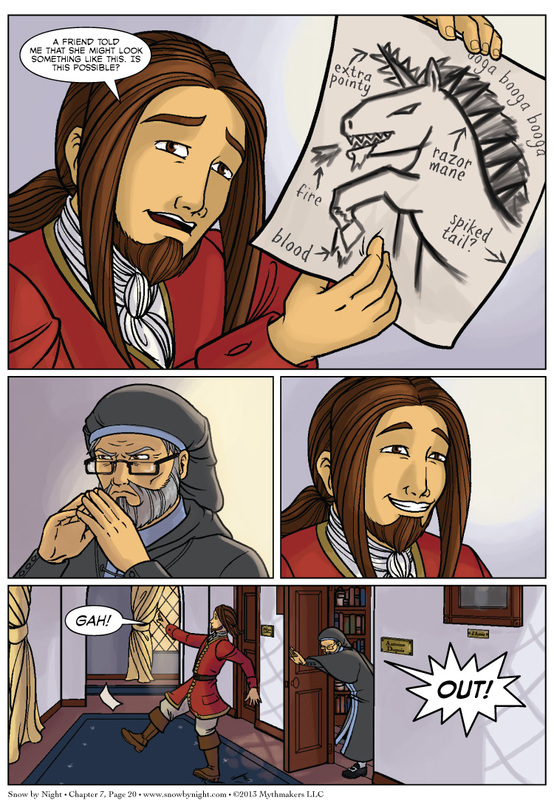 Blaise shows off his excellent imagination and mad art skillz on Chapter 7 Page 20. Antoine is not amused. Since Eric and Brittany are headed off to Canada as of 4am today, Diane is here to handle the updates while they’re snoozing on a train. I’m glad I got to introduce this page, which was one of my favorite parts of the script when Eric showed it to me. Brittany & Naty did a great job executing it. To see what Jassart and Snow-by-Night are up to in the meanwhile, vote for us on Top Web Comics for a sneak preview of the next page! Ahahaha Blaise, you never fail to make me laugh! There there, Blaise. I thought it was a very academic question. I’m betting Antoine thinks Blaise is pulling a prank on him. Or committing heresy. Or both. Many gods/godesses have two aspects:calm and angry, benevolent and destructive. It’s not just regular pointy, it’s “extra pointy”. Maybe if he hadn’t written on it, Antoine might have taken him more seriously.